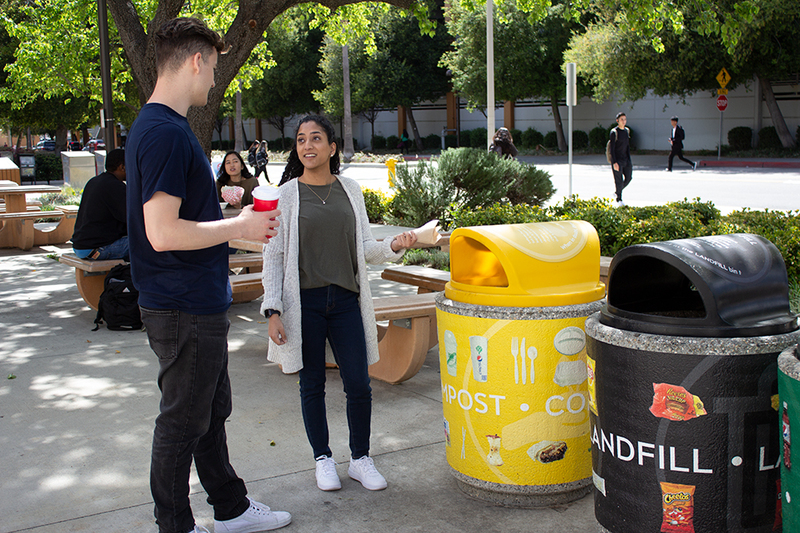 A CSUN student holds a reusable cup while another student disposes of compostable napkins in a compostable bin. Photo illustration by Liezl Bitas. Associated Students Sustainability and Recycling students spread the word about sorting and recycling, at "Meet the Clubs" on Jan. 30, 2019. Courtesy of Associated Students. Students showcase recycling and sorting bins during America Recycles Day on Nov. 13, 2018. Courtesy of Associated Students. Students share recycling information, during America Recycles Day on Nov. 13, 2018. Courtesy of Associated Students. Earth Week is approaching at California State University, Northridge, where students, faculty and staff are organizing festivities and programs to remind the community about global and local environmental issues. Behind the scenes, however, sustainability efforts are a year-round endeavor. 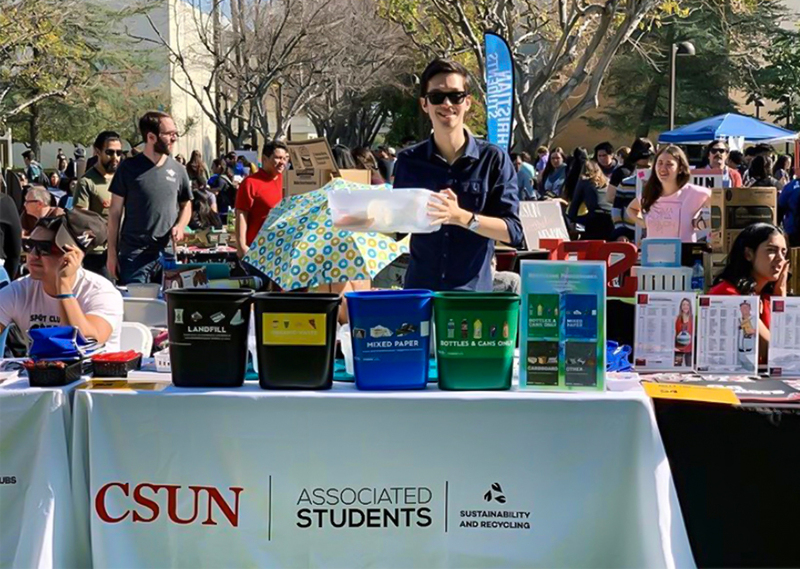 The university’s key environmental focus in 2019 (and coming years) is a Zero-Waste Plan — to eliminate 95 percent of all CSUN’s waste output destined for landfills. In 2014, the California State University system collectively drafted goals to achieve zero waste on all 23 campuses. Under this plan and using 2006 data as a benchmark, solid waste disposal rates must be reduced to 80 percent by 2020, in order to attain the target of 95 percent waste reduction by 2025. College campuses generate several pounds of waste every minute, but a majority of what is thrown away can be recycled or reused. 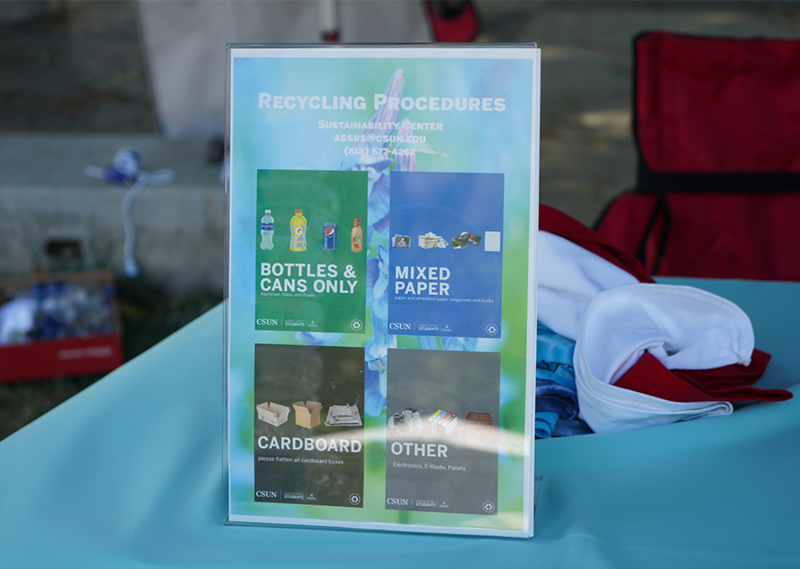 Diverting such materials — bottles and other hard plastics, cans, paper, cardboard, electronics, furniture and more — to be recycled, reused or donated will help reduce the amount of waste sent to landfills, according to CSUN officials. CSUN is preparing to launch an educational campaign to encourage students, faculty and staff to help meet the Zero Waste goals. The university has taken proactive steps toward change, achieving 70 percent waste reduction by 2017 — putting CSUN on track for the 2020 target. A number of pilot projects are in the works to further expand the zero-waste efforts. One of these is a plan to remove classroom trash bins and have centralized multi-stream Zero Waste bins in corridors. 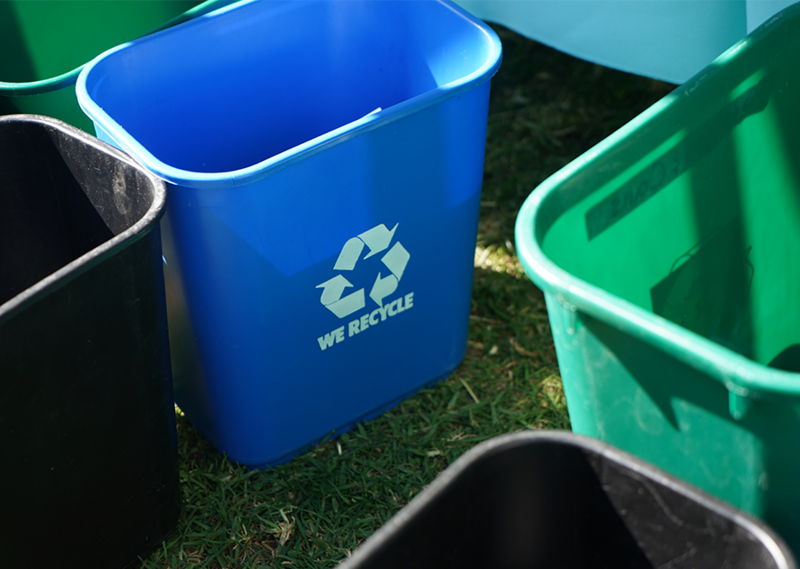 “[The centralized bins] make people think about where they throw their materials,” Eriksson said. An ongoing venture to make the Sierra Center a zero-waste facility promotes on-site composting and ensures all products coming out of the kitchens are compostable or recyclable. New three-bin sorting stations — for segregating waste items into “compost,” “landfill” and “recycle” bins — have been placed around the Sierra Center, which CSUN staff plan to replicate across campus, Eriksson said. Other campus-wide sustainability initiatives since 2016 have included replacing the CSUN Ground Shop’s gas-powered maintenance equipment with zero-emission electric equipment; widespread re-landscaping and cultivation of drought-tolerant plants; the use of “hydrogel technology” injected under campus lawns to cut back on irrigation and conserve water; and implementing LEDs and “smart lighting” control systems. In a nationwide, collaborative effort, CSUN President Dianne F. Harrison joined other university presidents in signing a pact as part of the American College and University Presidents’ Climate Commitment, working with the nonprofit organization Second Nature and pledging to improve their institutions’ practices to reduce greenhouse gas emissions. Last February, Harrison was among the signatories of letters addressed to President Donald Trump, calling on his administration to support a global mission to reduce hydrofluorocarbons (HFCs) — a greenhouse gas a thousand times more harmful than carbon dioxide. She and CSUN were also signatories of “Nature’s Call to Action for Accelerating Equitable and Just Climate Solutions,” a renewed pledge to raise awareness on college campuses about climate change. While the university is making larger, macro-level strides toward its waste reduction goals, individual steps made by CSUN students, faculty and staff count just as much. Bringing reusable containers for food and drink to further reduce individual waste output is a good place to start, Eriksson said. CSUN student Adam Weitzmann, a junior majoring in urban studies and planning with an emphasis in environmental planning and sustainability, said one of the most meaningful things he does as an environmentally conscious student is being aware of proper recycling procedures on campus. Weitzmann encouraged his fellow students and other members of the CSUN community to turn away from single-use water bottles and straws, in favor of reusable alternatives. As a student outreach assistant for the Associated Students’ (AS) Sustainability and Recycling, Weitzmann said he hopes to see students and younger generations make sustainable lifestyle choices and get educated about other ways to be friendlier to the Earth. “As a young generation ready to make our impact on the world, we, as students, must know the importance of living sustainably and making sure we educate future generations to follow the steps we take in being environmentally friendly,” he said. A screening of “Aquaman,” 7:30 to 9:30 p.m. on April 8. Cal Fresh Outreach Day at the Farmers Market, 10 a.m. to 2 p.m. on April 9. A walking workshop that begins at Santa Susana Hall 115, 12 to 12:45 p.m. on April 10. This year’s Earth Fair: “Trashpocalypse,” where on-campus, local and outside vendors will showcase their environmentally friendly goods and services on Bayramian Lawn, 10 a.m. to 3 p.m. on April 11. For more information on CSUN Earth Week 2019, visit https://www.csun.edu/as/events/earth-week-2019. For more on the university’s sustainability efforts and how you can take part in making the campus greener, visit https://www.csun.edu/sustainability. Waste reduction and sustainable materials management data can also be accessed through CSUN’s interactive waste tracking website: http://csun.wastetracking.com/.